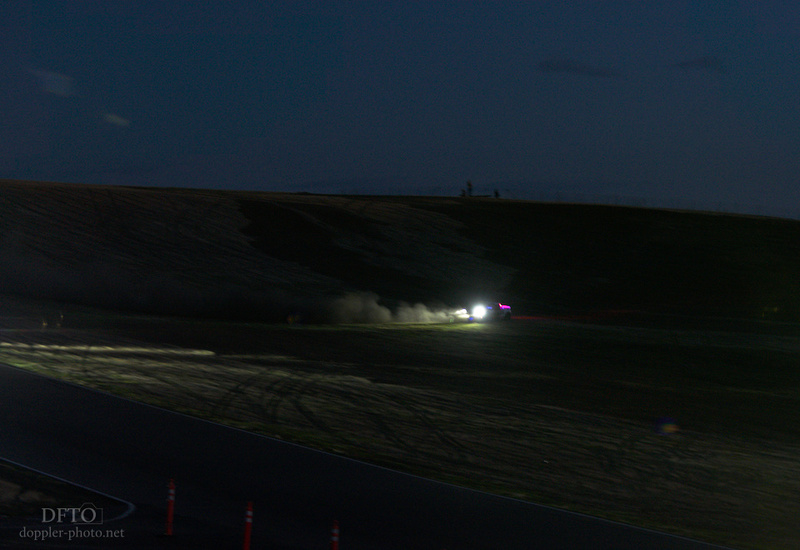 In some ways, an endurance race is a lot like a rocket launch. You put a lot of energy into getting up to speed and getting good track position. During those more aggressive parts of the race, you might make mistakes and have to work even harder to make up for them. You have a plan and a strategy, and you do your best to stick to them. By the time the sun comes up on Sunday morning, you're mostly coasting on momentum. Track position has already been pretty firmly established, and you're doing your best to just keep things on the straight and level. The race isn't over yet, by any stretch of the imagination. But even for teams that are still trying to make moves, their goal will generally still be to hit a pace that they can maintain through the checker. Which is harder than it was earlier in the race, because the combination of poor visibility and fatigue increases the likelihood of mistakes. And the thought of not finishing after making it this far through the race will cause most teams to race a bit more conservatively. 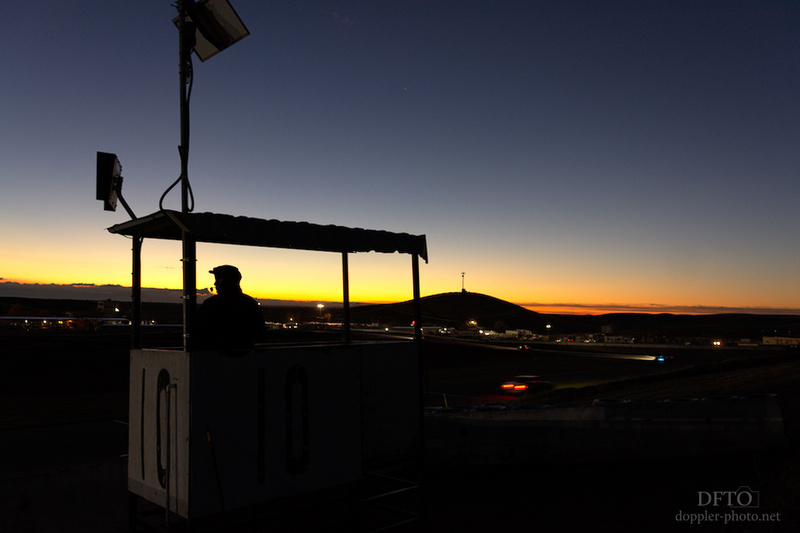 The morning also brings a renewed sense of the beauty of the track. At night, it's easier to appreciate the cars — the relative brightness of their brakelights broadcast a clearer picture of what's going on in the cockpit than can be readily seen during the daylight hours. 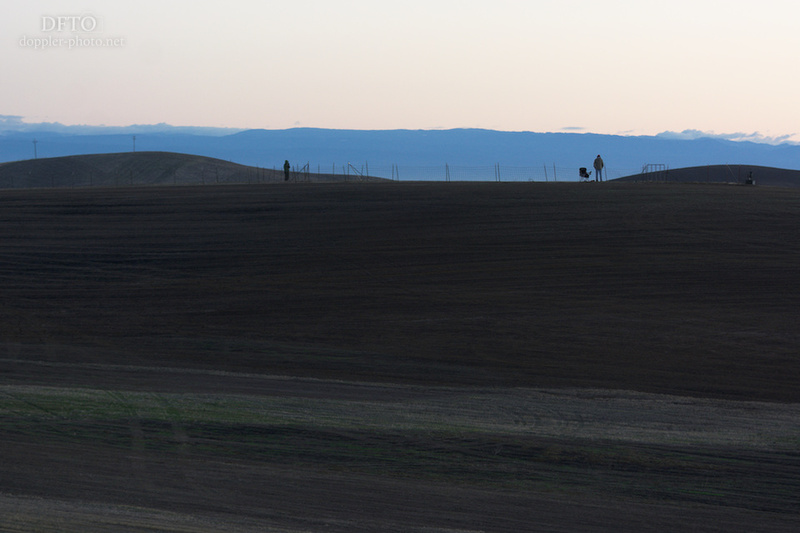 But that same darkness shrouds the shape of the terrain, and makes it incredibly difficult to see anything far away from the paddock. Sunrise changes that. And there must be something about seeing the sunrise after the exhaustion of 21 hours of racing that makes it feel even more special. Maybe it's that it gives you a concrete sense of how far you've come, how long you've endured, even though there's still more yet to come. 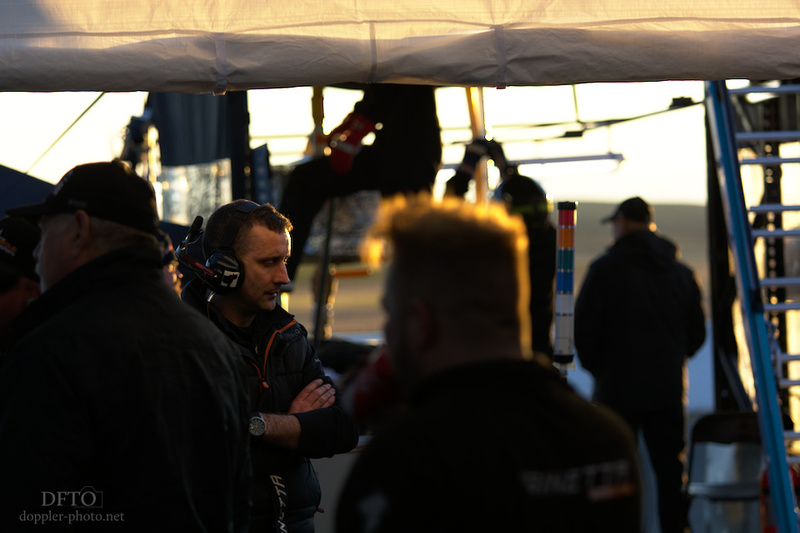 In an unfortunate parallel to the prior year's race, as Sunday morning came into full swing, both of the Ryno Racing Ginetta cars started losing rear wheels at an alarming pace. An earlier sense of optimism at being able to hold 2nd and 3rd places, and perhaps gain ground on 1st, gradually shifted to a somber unease at the prospect that the team's cars would continue giving up ground as they encountered recurring late-race mechanical issues. 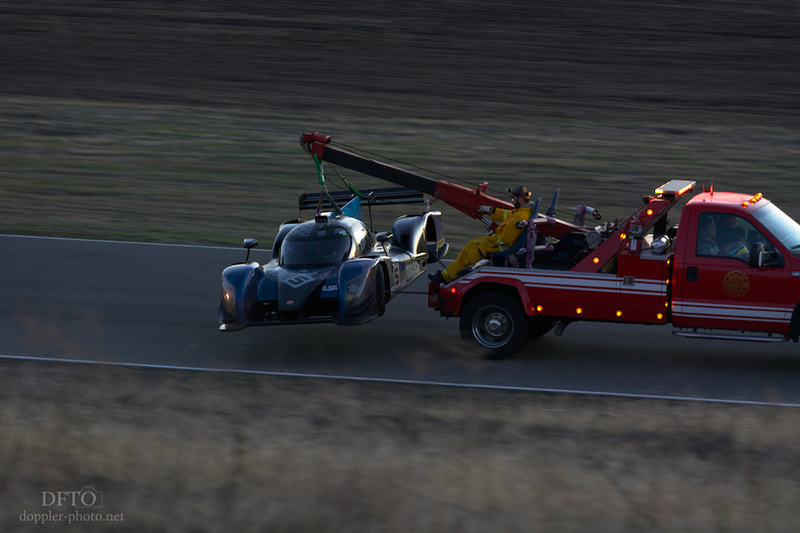 The team would eventually park both cars as a result of the issue. Simply finishing the race remains one of the greatest challenges of The 25. In the meanwhile, the other teams were cruising along, trying to minimize how much they had to touch their cars. 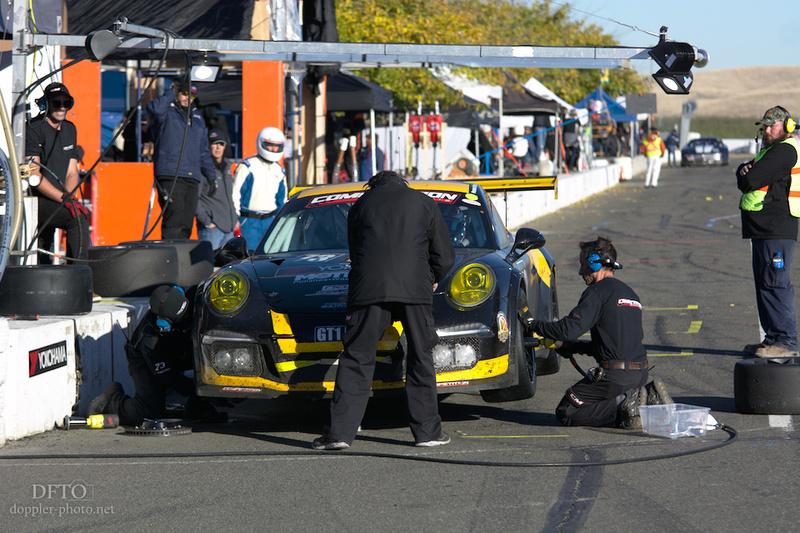 For a lot of them, they put a little bit of extra time into final mechanical pit stops to make sure the cars were solid for the finish. In this case, that included a brake rotor swap, in addition to the typical fuel and tires. 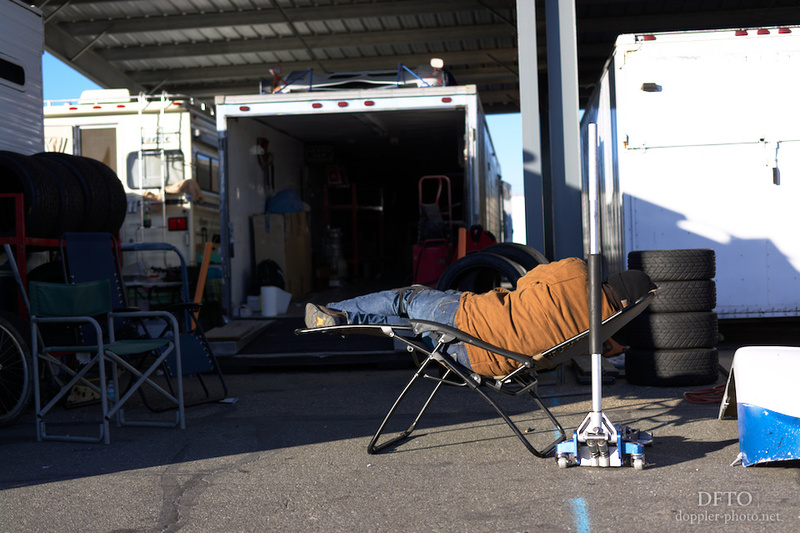 Once the various team crews ran out of work, whether due to attrition or to solid track position, some of them rested up a bit for the finish as well. 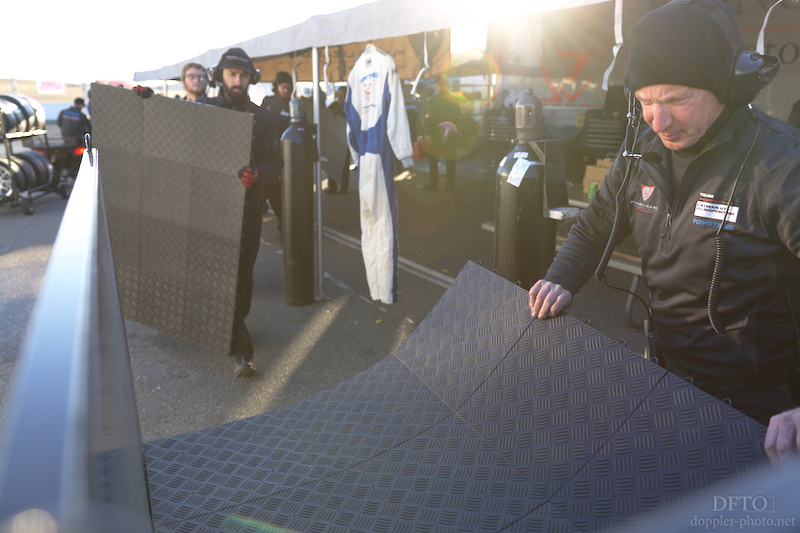 With a tight grasp on 1st place and with their second car already retired from the race, the Flying Lizard Motorsports team started to clean up their paddock space. The checkered flag was right around the corner.